Any self-respecting makeup lover will surely have at least a small army of makeup brushes at her disposal. After all, what is an artist without their tools? 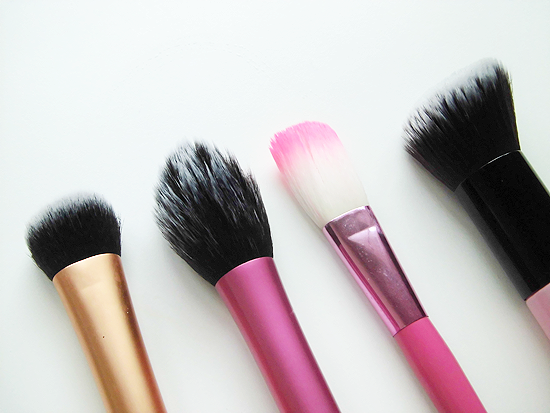 But whether you have 5 makeup brushes or 50, one should always keep them all in tip-top shape. It's a good thing that brush maintenance is a no-brainer, really. It's all about regularly cleaning them. A deep cleaning once every 2-3 weeks and spot cleaning every 1-2 weeks is best on average. Of course you can adjust the time frame depending on how often you use your brushes and/or how acne-prone your skin is; dirty brushes harbor tons of dirt and bacteria after all. The cleaning task can undeniably be time consuming though, especially if you have a lot of brushes. But a recent discovery of mine has helped to speed up the entire process significantly and it's all thanks to the Brush Egg! 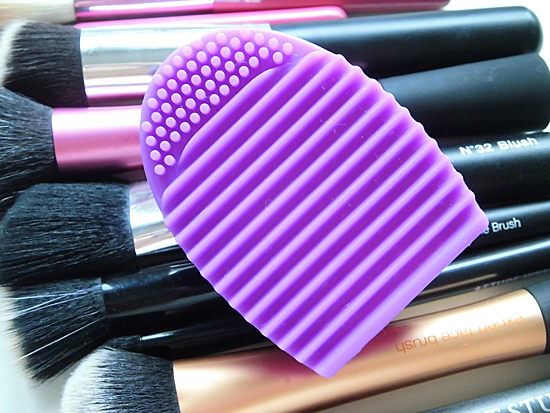 Product description: The Brush Egg is used to help with the deep cleaning process of makeup brushes. is quick, easy, affordable, and effective. reduces the use of brush cleaning solution (which dries out bristles). can be used with any soap or shampoo of your choice. I first saw this little cutie online at kalmcosmetics.ph and actually purchased it already, but I totally forgot to pay for it via bank deposit the next day and my order was cancelled. D'oh! Luckily I spotted it at The Ramp (Glorietta) soon after and bought it there instead. It was tucked away in the Real Techniques and Ecotools display. I'm only mentioning that because KALM Cosmetics is the official and only distributor of Real Techniques and Ecotools here in the country, so in the end I did actually end up purchasing it from them! Haha. 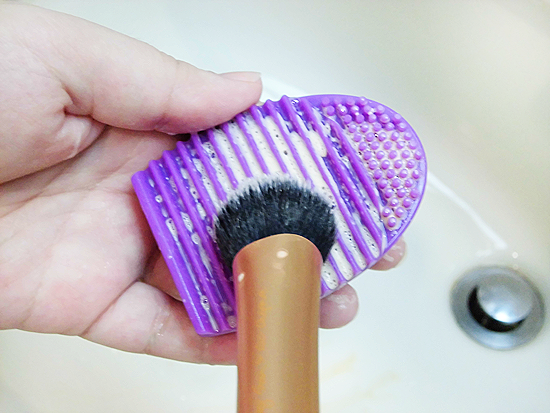 Basically the Brush Egg's purpose is to help you clean your brushes faster and more throughly. The grooves you can see are what helps to break up and clean out all the makeup, dirt, and oils that have accumulated on your brush. Think of them as like those old-fashioned washing boards you see in movies or cartoons! The smaller 'knobs' on top are meant for foaming and lathering, but you can also use them for brushes with smaller 'heads' like eyeshadow or concealer brushes. 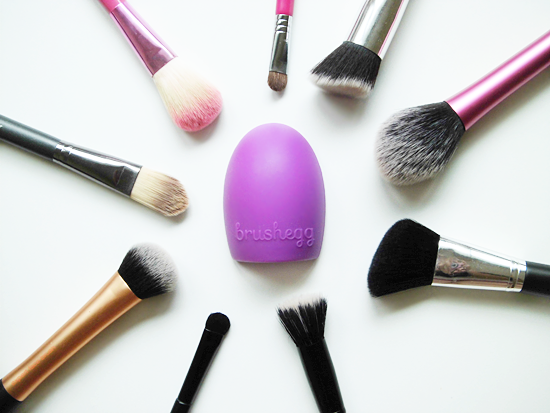 The Brush Egg is super easy to use. After soaking the brush bristles under the tap and lathering it up with my brush soap or cleanser of choice (I'm currently using the Takeda Brush Purely SOAP I got from Japan), I just swirl the ends and sides of the bristles gently all over the grooves or the knobs for a minute or two, then rinse the brush. For my more frequently used brushes, I repeat the process at least once more. So far I find the knobs don't really make much of a difference in terms of helping the soap foam up or lather more, but I still prefer to use them for the smaller brushes in my collection. Ta-dah! Still wet but squeaky clean brushes! I'm going to cut straight to the chase here and say I loooove the Brush Egg. Before I had this I used to rely on the old method of swirling the soaped up brushes against the palm of my hand, rinsing, then repeating. My smooth palms were just not as effective as the grooves and knobs of the Brush Egg when it comes to gently agitating the bristles, so any makeup residue and dirt would take more effort and time to get rid off. I'm not even exaggerating when I say that I'd sometimes spend a minimum of 5-10 minutes each for the likes of hardworking foundation or blush brushes. Imagine how much time that takes if I had to clean even just a few brushes! With the brush eggs I now only have to spend 5 minutes or less for each brush, no matter if it's a brush I use often or hardly use. The Brush Egg, in short, is worth every penny. And you won't need to spend that many pennies in the first place since it's totally affordable too. The fact that it's made of high quality rubber also means you won't need to re-purchase a new one for a long while, so do your brushes a favor and show them some extra love with it! Cleans my brushes more throughly. Helps me clean my brushes faster. It has a versatile grip. You can either hold it like I do, or use the large hole at the bottom to slip your fingers inside. Available in 3 shades: lavender, light pink, and mint. The knobs don't really make much of an added difference with foaming and lathering. Note: As with many beauty products and tools out there, dupes or knock-offs for the Brush Egg are abound. Daiso has their own 'version' which you can check out from this review (the only differences are the logo on the back and the colors available). When researching about this product, I noticed that the color I chose is not available on the official Brush Egg website. There is a purple one, but it doesn't seem to be the same shade as the one I have. Naturally this made me wonder if perhaps KALM Cosmetics are selling non-original Brush Eggs. There are a lot of knock-offs online that look exactly the same, right down to the logo, but in a wider variety of colors. Just check eBay. KALM sells guaranteed authentic Real Techniques and Ecotools products though, so I was confused and wondered if perhaps the color I have is just no longer in production, especially since KALM is also selling the Brush Egg in a light pink and mint shade that look the same as the one on the official website. As of now there's no mention or evidence of discontinued colors, so I cannot say for sure if the one KALM sells are non-original, if the Brush Egg company simply decided to change the color without any notice, or if it's just a change in lighting at play here that makes the colors look different Either way, the one I purchased works fantastically so I have no complaints! Besides, since KALM sells other authentic goods then I will give them the benefit of the doubt.